Fiddling around on my fingertips. Learning. What? (1) This way is a nice break for the wrists, and my fingers feel strong and okay. It’s not as rough as it looks. Thumb pad/muscle is a little tired now, a few hours after practicing. (2) It is much harder to balance, duh, not sure I learned that. I think I knew that. (3) It is much harder to maintain integrity in my core, and sway back happens right away. (4) My arms naturally stay straighter, even kicking up, even that left one that always wants to bend. I like that. Not bad learning. For a Monday morning with dishes still in the sink. 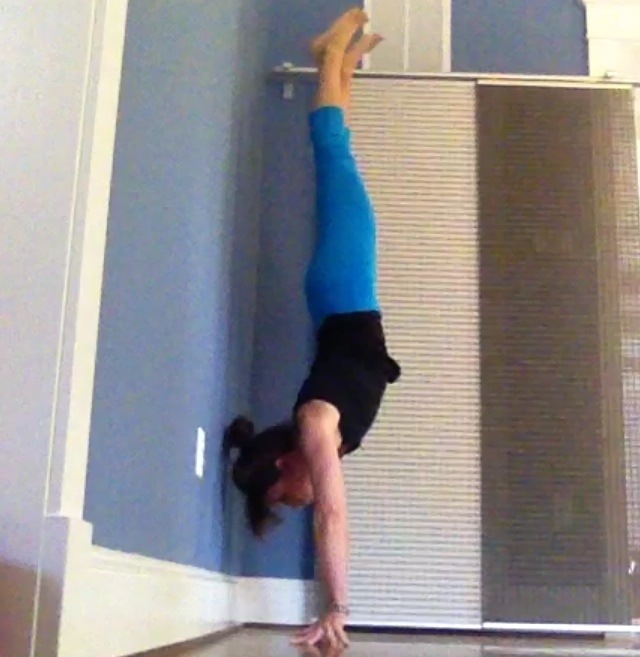 Handstands are fun. Oh, good lord. You have to be kidding. Stop it!